Happy Quilting: Modern Building Blocks Back to Nature??? So remember when I posted about how I bought this pattern and jumped on the bandwagon to make it up . . . Well, it has been a month and I haven't started a stitch. Mostly because I have been debating back and forth on what fabrics to use. But the other day, I saw this little bundle sitting on my shelf and wondered . . .would it work???? These are the leftover I had from my Modern Solids Box. I used all of the bright colors for my Off Kilter quilt and was left with this lovely bundle of beautiful muted tones. So now I am wondering, have I found the right bundle?? Is it time to start cutting?? What do you think??? Can I pull off a Modern Building Blocks Back to Nature edition?? I'd say go for it. Otherwise, you might be second guessing yourself forever and you'll never start the quilt. The fabrics are lovely - but I'm biased since I love blues. I think you are good for the basics, but a little pop of red, orange and yellow would be great. You could probably use a few scraps for those little pops. Absolutely you can do it! It would be fun to see it in the modern design too. I think it would be great is the solids. Waiting to see it, soon I hope. I do think it needs more pop. Maybe take the browns out and add more greens and grays with a splash of red or scarlet here and there. Those fabrics speak to me! This would be a wonderful quilt. To me it almost reads as a neutral quilt. Those fabrics would make a beautiful, calm, low-volume quilt! 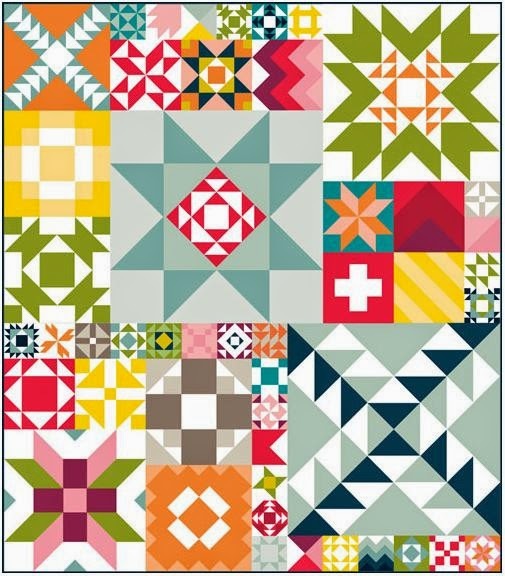 I LOVE those fabrics together and can't wait to see them used in this quilt...just them!!! Those are really pretty colours. Somebody before commented to do little pops of colour and I agree. Yellow would be a good example. I think it would be beautiful in those colors! I love those colors; I think I'd add a little yellow and orange to set them off. Those colors say back to nature to me, including the browns. I would think a little bit of accent colors could look wonderful. I'm partial to blues, though, so they all look good to me! Yes you can,yes you can! I think every thing you create is amazing. I love the colors, but also think there needs to be a "pop" of color somehow. Those colors are so comforting. I love them.